During a recent press presentation at Baselworld I found myself admiring a rather exquisite timepiece - then immediately turning to the journalist to my right and saying, “It’s great – but how do you tell the time?” It’s a question that’s been cropping up more and more frequently thanks to a new vogue for dials that eschew traditional hands and indices for a display which offers something entirely new and unusual. This is undoubtedly a response to an age where smartphones are our primary timekeeping devices. As Augustin Nussbaum, head of product development at Ulysse Nardin, attests, “The first function of a watch is not what it used to be. What people look for now is originality in a world that is becoming more and more standardised.” The brand, accordingly, has been a leader in the field of non-traditional watches, introducing its Freak collection, which matches cutting-edge mechanics with unusual displays, in 2001. The most recent addition to the collection is the Freak NeXt, an ultra-modern timepiece which foregrounds its mechanics by displaying the hour via a rotating window and using its innovative oscillator movement as a minute hand. “The cutting-edge technology of the movement was, of course, paired with an ultra-modern design and the ‘absence’ of dial was aimed at creating this avant-garde look. It was a choice, not a necessity,” explains Nussbaum. The result is unarguably striking, with the intricate blue oscillator contrasted against an almost entirely white timepiece making it clear that this is a serious bit of horological kit. For others, however, stepping away from time-honoured tradition is not merely a design choice but their entire raison d’être. 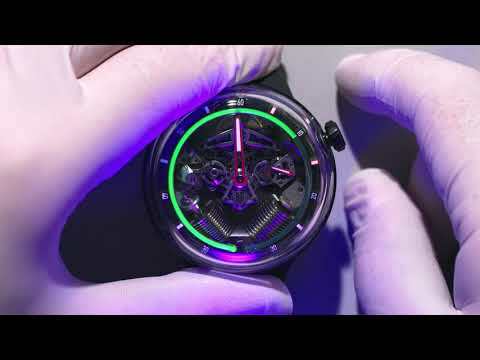 Founded in 2012, watch world disruptor HYT uses a unique system which displays the time with a gauge that fills with coloured liquid over a 12-hour period, springing back to the beginning at 6am and 6pm each day. 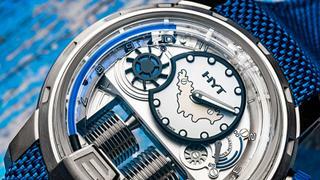 For HYT, however, this is about more than aesthetics or standing out from the crowd. And, while this may sound a little philosophical for those who just want to know if they’re running late for a meeting, HYT’s gauge-style display addresses a pressing modern issue. In 2018 a report found that many British schools were replacing analogue clocks with digital ones because students were unable to read the older dials, with the problem only due to worsen as children grow up surrounded by smart devices. Comparing HYT’s display to a computer progress bar, Dourde argues it is actually a far more intuitive way of telling the time, using as evidence the recent decisions by Ferrari and Lamborghini to switch from hands to gauges on their dashboards. 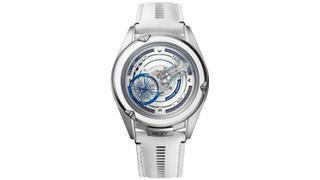 Which isn’t to say that aesthetics alone won’t be enough to win over even the most discerning watch wearer. At SIHH 2018 Cartier bowled over press, buyers and consumers alike with its Révélation d'Une Panthère. The traditional timepiece featured a dial covered by tiny golden balls which, when tilted, trickled down and magically revealed the outline of the brand’s signature panther motif. Gucci, meanwhile, is hoping to curry favour at the mid-market level with its new quartz Grip collection designed with a solid metal case displaying the time and date via three rotating discs. 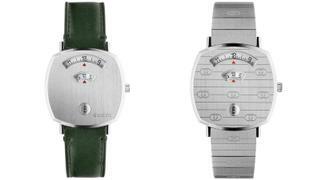 Reservoir, a relative newcomer to the watch world, is also tapping into the trend with its line of watches inspired by boat, plane and car gauges which feature an hour window and retrograde minute dial. 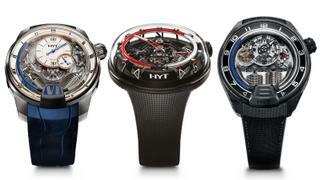 While these watches may never become the norm or even affordable for most – HYT’s entry-level timepiece is £33,000 – those concerned about the future of mechanical watchmaking can rest easy. This historic industry has plenty of tricks left up its sleeve.